Google India Managing Director said on Tuesday that Indian Internet users will surpass the number in the US by the end of this year and around 500 million people will be online by 2018. “Even at the current growth rate, we will have 500 million Indians on the Internet by 2018. 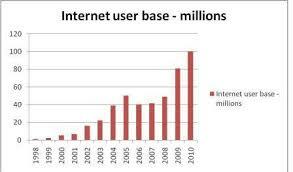 By the end of this year, India will become larger than the US in terms of number of Internet users. By 2018, India will have twice the number of Internet users as the US does. Almost half the country will be connected through the Internet,” he said while addressing “Digitizing India” organised by FICCI Ladies Organisation. He also said that that it took the country 10 years to go from 10 million Internet users to 100 million Internet users. At present about five million new Internet users are being added every month to India and it has now 200 million Internet users.